You’ve seen them, right? 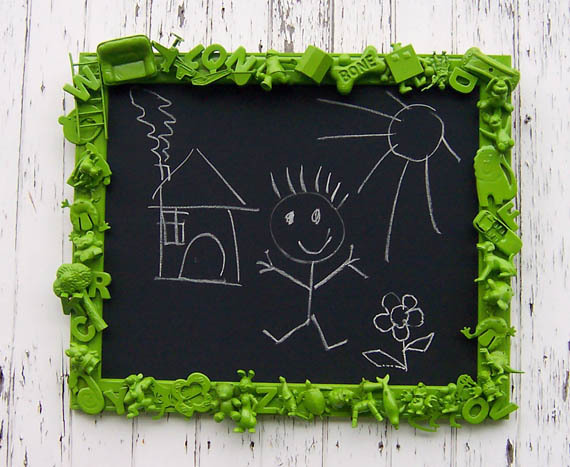 Those cute chalkboards for kids rooms, made by gluing old/broken toys to an old frame, then spraying it a bright colour? 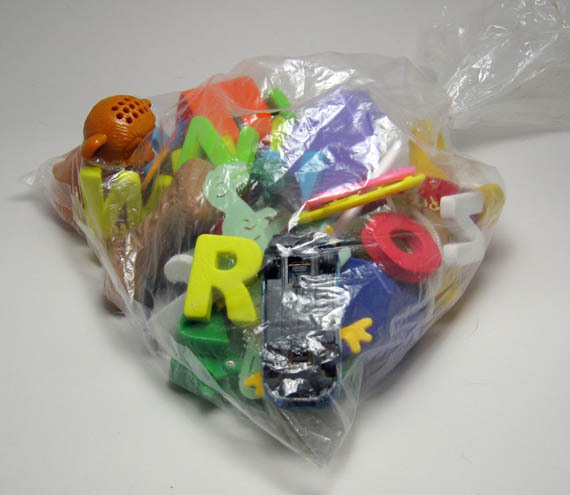 Well, I decided to make one when I found a bag of plastic toys for $1 in an op shop some weeks ago even though I don’t have kids. It looked like so much fun. I added more toys to the collection from other shops till I had enough to make a large chalkboard. At the exact same time I was getting ready to do this, an episode of Better Homes and Gardens came on TV and that DIY chick was making the exact same thing. Only she did a ‘classy’ one. 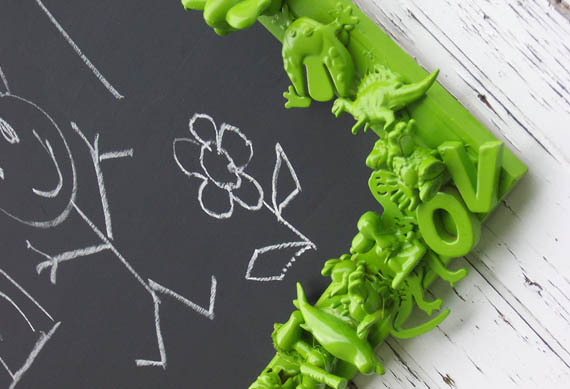 She said it was easy – just get the hot glue gun, glue the toys to the frame, give it a couple of light coats of silver spray paint and voila! Done. Well I did that. 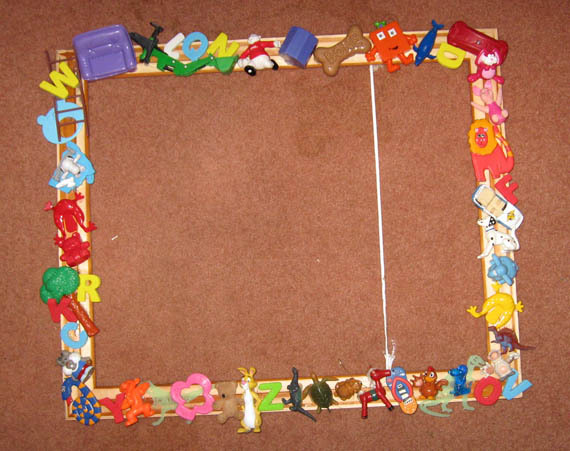 I sat down at my coffee table/work table in front of the TV one night and hot glued toys to the plain pine frame. Though, first, I have to mention that the frame I had wasn’t entirely flat so I had to sand and plane it to make it flat. Then I got out my friend and enemy, the hot glue gun. I let it dry, then took it to the workshop where I set up a spray paint area and started spraying it lime green. Why lime green? It seemed like a cheerful gender neutral colour. I sprayed it in light coats. I sprayed. And I sprayed. I did a ton of coats from every side and every angle. I still missed spots where the colour didn’t take cause of the texture of one toy or other, or where the nooks and crannies of a toy refused to let the paint in. But that’s ok. I dont mind it being imperfect. It actually looks nice with a tiny flash of red or yellow here or there. In between the million coats of spray paint, I took image that came with the frame and painted over it with store bought chalkboard paint. I gave it 2 coats and it looked great. 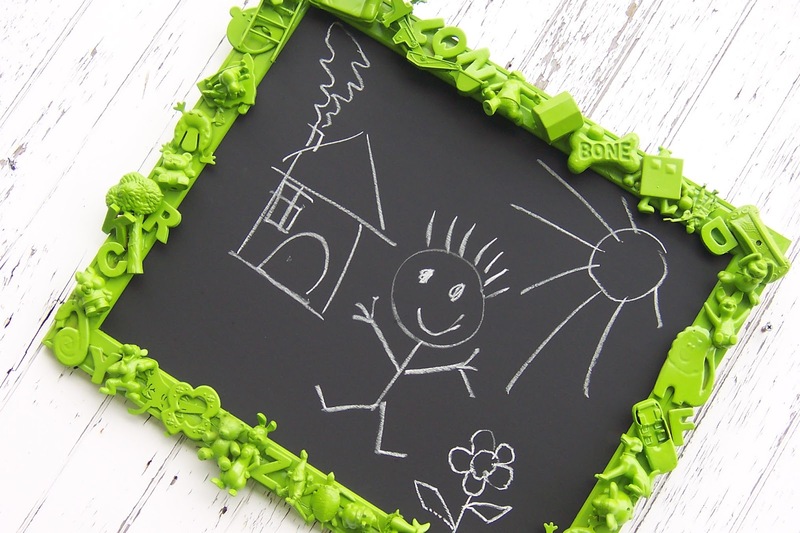 Then I put the chalkboard into the frame, put screws in and wire to hang it and it was ready. I put it in my car to take to a local shop to see about selling it. That’s when the dophin came off. Quick fix glue job. Touch up of spray paint once the glue was dry. Back in the car to go to the shop. There’s a new shop in New Norfolk which sells kids stuff – gifts, books, clothing. New and 2nd hand, handmade and not. When I went to take it out of the car Bugs had come unstuck. Damn. It worked fine on TV! Some superglue (which didn’t work) later, I was talking to the lady in the shop. She loved it. She was excited about the idea of selling it in her shop. Great. I’ll just take it home and glue it again and bring it back next week. I feel like ripping the toys off and throwing it away to be honest. But I won’t. I’ll glue it again, using cement this time. See how it likes them apples! And then I’ll tell the lady in the shop that its to be sold as a decorative piece, NOT a piece for children to actually USE. It’ll work fine as a piece of art on a nursery wall. So much for following BH&G instructions. Maybe pinterest would have offered more practical suggestions?